Although New Zealand sits unsurpassable at the top of their group, Fiji and New Caledonia will be playing for experience, exposure and pride when they face in the first leg of their 2018 FIFA World Cup Russia™ OFC Stage 3 qualifiers at Churchill Park this Wednesday. After defeating Solomon Islands 1-0 in a friendly encounter at the same venue last week – motivated by a sea of boisterous Lautoka fans – Fiji coach Christophe Gamel is hoping for tomorrow’s home crowd to have the same effect. “The crowd is the twelfth player,” he said. The two OFC Stage 3 encounters are key stepping stones in Gamel’s plan to build more depth within the national team, which the Frenchman plans on achieving by giving younger players game time against New Caledonia. “We are preparing for the future. I have started a new process with youth and this will be a good test to give players experience,” he said. “New Caledonia are a very good team and I’m taking it like a test. It’s always an honour to represent Fiji in a World Cup qualifier and everyone – agents and clubs – look at these kinds of games to find players. New Caledonia coach Thierry Sardo has his focus on the future as well, and plans on using the matches to develop a stronger, more structured future national team. “For us, as for Fiji, a new cycle is beginning with an eye on the OFC Nations Cup 2020,” he said. With captain – and New Caledonia national team veteran – Bertrand Kai suspended for the matches after a red card in their last fixture, Sardo has applied a similar plan to Gamel, bringing younger players in to join the experienced squad. His side hasn’t taken the field together since their encounters with New Zealand in November but with all his players match-fit following their domestic league, Sardo is confident in Les Cagous’ earning the upper hand over Fiji. Vital Statistics: Currently sitting 19 places below New Caledonia on the FIFA/Coca-Cola World Ranking, the clashes with New Caledonia could contribute to movement up the ranks from their current position of 181 if Fiji can turn positive results. 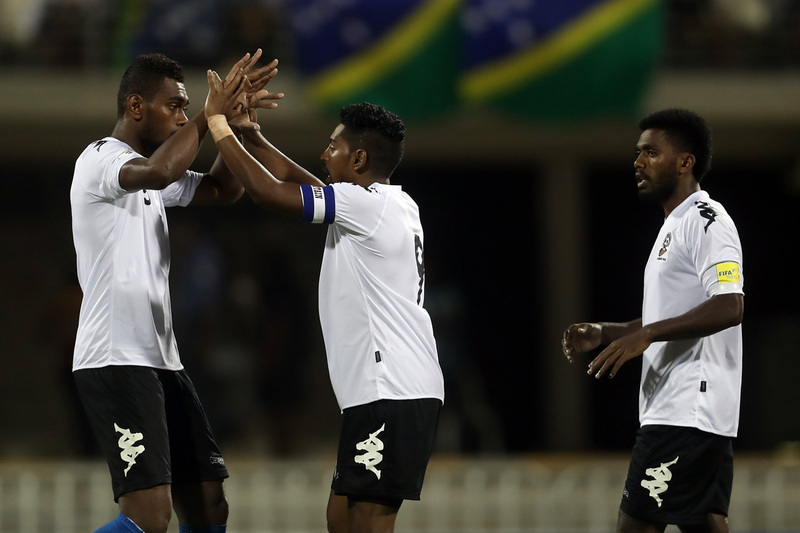 The Players: In Fiji’s recent friendly match against Solomon Islands, defender Kolinio Sivoki proved that any player on the field can find the net, using his precision and accuracy to score the winning penalty kick. With six caps for his country already, the 22-year-old has proven himself an anchor in the backline and a challenge for some of the region’s best attackers. Vital Statistics: The average age of the New Caledonia team in last year’s OFC Nations Cup was 25, but the team is two years younger for their upcoming matches, averaging at 23. The youngest in the squad, Shene Welepane, is only 19-years-old and will be making his first international appearance in the senior team after representing New Caledonia at the 2016 OFC U-20 Championship in Vanuatu. The Players: Experienced defender Emile Bearune has represented Les Cagous over 30 times, and played a pivotal role in their 0-0 draw against New Zealand in their last 2018 FIFA World Cup Russia™ OFC Stage 3 fixture. Bearune’s patience and precision when defending created several counter-attacking opportunities in both of their New Zealand fixtures.